My son LOVES dinosaurs...but he also loves cars. Do you know a child like that??! Well, you don't have to choose between the two gift ideas for them this holiday season because VTech has the perfect gift idea for any car and dinosaur lover: the VTech® Switch & Go Dinos® Turbo Bronco the RC Triceratops! I love how easy this toy is to operate! 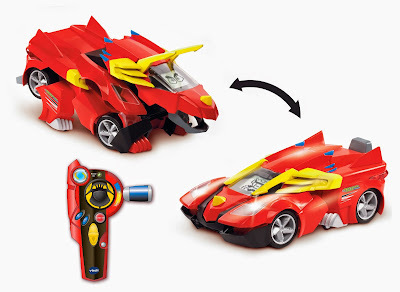 Use the remote control to move forward, backward, left and right in both vehicle and dino modes. Then charge the turbo boost lever to give him a burst of speed! Plus, you can press the buttons on the remote to turn on his headlights, hear realistic sound effects and learn cool dino facts. My son loves the Bronco’s LCD screen that displays cool customizable dinosaur eyes and driver animations, and how he can choose from four different styles! At 5 years old, this toy is really easy to operate for him and he loves racing it around the house! His other favorite part is how many different sounds he makes: about 70+ wild sounds and phrases! The VTech® Switch & Go Dinos® Turbo Bronco the RC Triceratops is a fun toy that will give children the adrenaline they love from racing cars and the fierceness they love from dinosaurs! This toy is recommended for Ages 3-8 years. 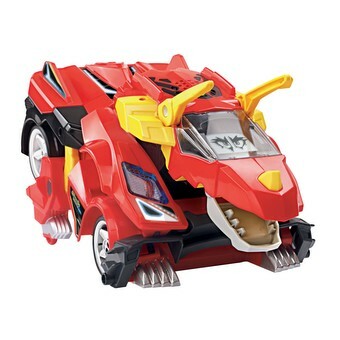 You can purchase the VTech® Switch & Go Dinos® Turbo Bronco the RC Triceratops for $44.99 from the VTech website. VTech is generously offering (1) VTech® Switch & Go Dinos® Turbo Bronco the RC Triceratops to a lucky winner!